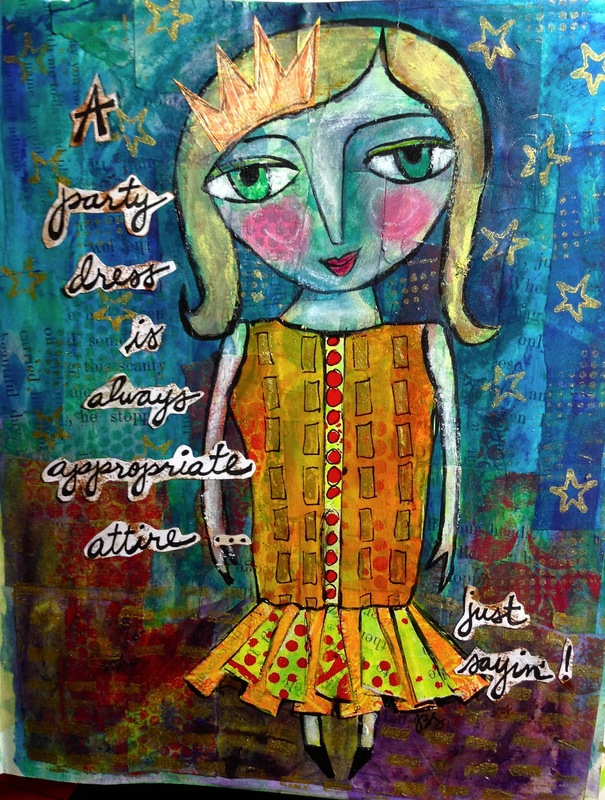 Jessica Sporn Designs: Gelli Plate Party Time! and made a collage. She drew herself a beautiful party dress and added more pieces of her collage paper to make sure her dress could really twirl (just in case there's dancing!). She used fluid acrylics and glazing medium to paint away a lot of the background, to make sure that SHE, and not the beautiful collage papers, would really stand out. Portfolio watersoluble pastels and gelatos added to the shading and the sparkly stars and rectangles, stamped with gold ink. A tiara finished off the outfit. The party doesn't start 'til tomorrow, but she's stylin' her dress today just cause. See you at the party! Thank you for visiting! I read and treasure every comment, even if I don't always get to respond directly, and will answer any questions as quickly as I can. Linking to the gelli party at A Colorful Journey, Paint Party Friday, Art Journal Every Day, Simon Says Stamp (Anything Goes) and Creative Everyday. "I use stencils for scrape booking and card making, but you've got me rethinking the possiblities!" I've emailed Theresa and hope to get her stencil to her soon! PPS -- the new monthly challenge at Artists in Blogland is "Color This Quote!" Check it out, and see my entry here. Thanks for such a lovely comment - I really appreciated it. And I am planning to join the gelli party! I wish I had a dress like that! I think it would have made my January a lot better to wear a party dress to work every day. thanks for the smile. This is so cute! I LOVE her party dress, and tiara, and especially her rosy cheeks!!! Jessica! That dress is just plain AWESOME!!!! The pressure you put on me to get ready for this party, LOL! Jessica you are always so inspiring!! Love this girl....such fun with all this vibrant color!! A very happy place!! What a great lady to start the party! She's going to lead us all to the dance floor- I want to see her twirling that skirt! The way you have collaged her is spectacular! How darling! Love the skirt! 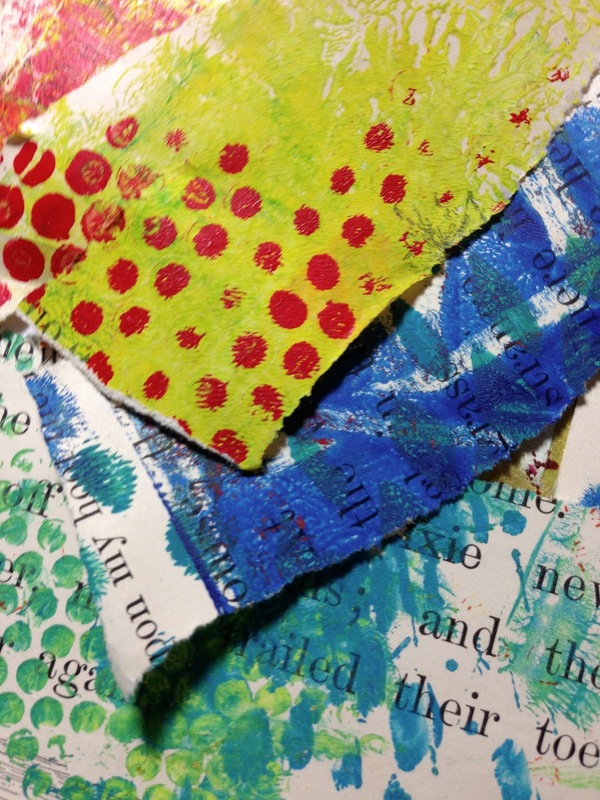 What a great idea for pieces of gelli prints! oh my gosh! what an adorable girl with a wonderful dress! YEAHHH!!!! Gorgeous piece, I love this! She is a lot of fun.. and really.. the tiera is a must to complete that outfit. Well done. I love her! A party dress is always appropriate. Another Gelli Plate party? Time to drop everything! I love seeing how you incorporated the gel prints into this page. Gorgeous textures and colors. Great painting AND saying! Happy PPF! Wonderful party girl, Jessica! Love all the colors. Nothing short of spectacular! lol LOVE this party girl! So delightful, Jessica! Love it! oh she's definitely the queen of the ball in all her glorious splendor!!! Jessica, this is totally awesome. Wow, it must have taken a lot of time but you really did a wonderful job. I love the dress! Thank you. OH! She is all dressed up and ready to go to the best party ever! I love all her bright colors and she does look like she is dancing to the stars in the lively background! wonderful combination of techniques used here! Also just to let you know my Hebrew Prayer stensil arrived safely. I see a wonderful opportunity to sit and stitch tiny stitches around each letter on cloth once painted there. And quite the meditation that will be! Thank you for making such a wonderous thing. I will go back to copy off the translation, as well, and put that on the back of the small art quilt it will become. I wish I had a dress like that. It's a lovely page and I like your writing. 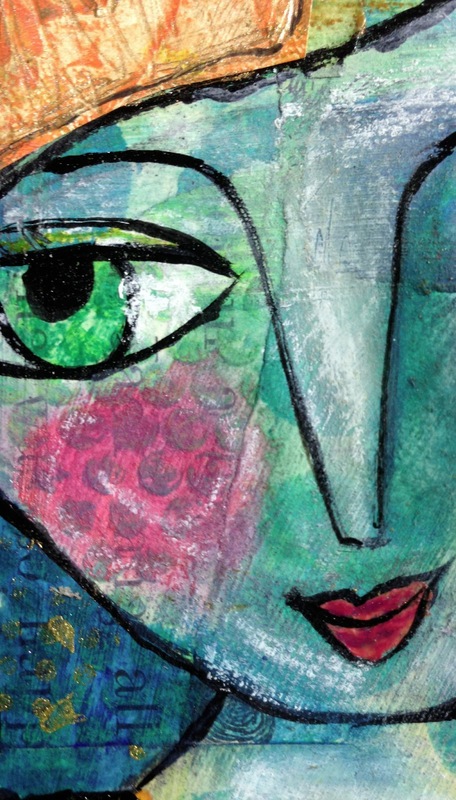 Love your colorful piece...great texture, and that face is a treasure! cute quote too! She is such a pretty little lady! I love her big eyes! 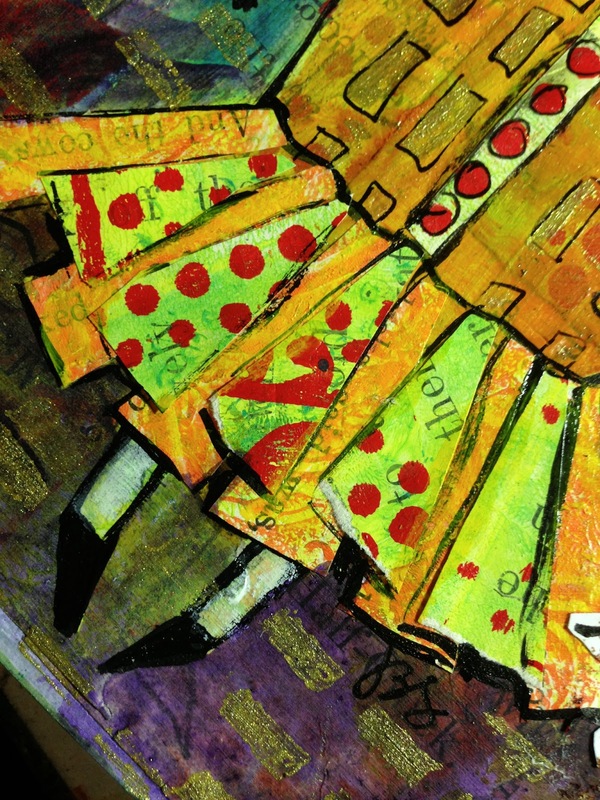 I just discovered the Gelli Party and yours is the second one I've viewed. So now it's definitely settled: I have to buy a Gelli Plate!! But now I'll have to sit tight till it arrives. Thanks for sharing!